Outlook 2013 WOW! SO NEW! It’s new it’s faster, it’s better. it’s……oh damn my IMAP won’t work. Certain email servers, with certain users running many sync folders will run into an issue where Outlook 2013 will sit at “synchronizing subscribed folders”. Haven’t really had time to research it too much however this is what I did to get around the IMAP Sync Lag. Basically this resolution worked for a few email accounts for myself, it may or may not work for you. 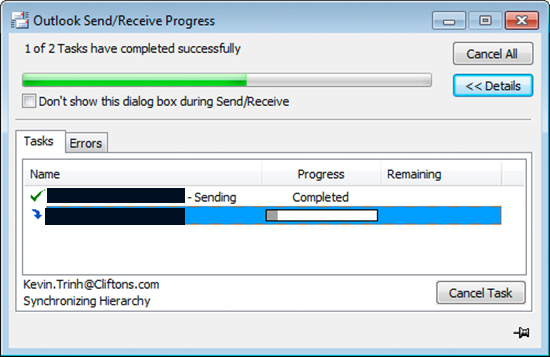 Here are the steps you can take to hopefully resolve Outlook 2013 sitting on Synchronizing for hours. Once finished you should see a noticeable improvement. If you have any other information to share, please leave a comment. Click on the “Subscribed” tab and click the “Query” button. Select the first item in the list and scroll all the way down. Hold shift and click the last item in the list. It may prompt about folders that cannot be unsubscribed, just click “OK” here. Select the “All”tab as we are now going to sync folders we wish or need to sync. Select “Drafts” and click subscribe. Select “Inbox” and click subscribe. Select “Junk” and click subscribe. Select “Sent” and click subscribe. Select “Templates” and click subscribe. Select “Trash” and click subscribe. Do this for any other folders you wish to sync with the server. Uncheck the option “When displaying hierarchy in Outlook, show only subscribed folders.” at the bottom of the window. Click “OK” to close the window, you should be good to go, this may not work for everyone, just to be safe, close and restart Outlook 2013.